Halloween is such a fantastic time of the year. 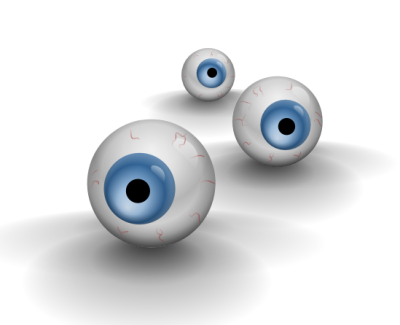 It is so much fun to dress up in scary or fancy costumes and attend parties or trick or treat with your children! If you're a crafter, you know that Halloween lends itself well to all sorts of creative possibilities. Whether you want to make your own Halloween costume or maybe create some homemade Halloween decorations, you can certainly craft something spectacular this Halloween! Find your Halloween paper crafting inspiration with Halloween Paper Crafts: 11 Homemade Halloween Decorations, Halloween Treat Bag Ideas, and More! Make homemade Halloween decorations, DIY treat bags, and more when you check out this printable craft collection. I'm super excited about the Green Kid Crafts' October's Discovery Box! The theme for October's box is Legends and Folktales. This box is full of activities that will promote the emotional and imaginative development of kids. Pint-sized kings, queens, knights, and princesses will have the time of their lives while creating their very own Storytelling Kit! Design wearable Crowns and have a blast hurling randoms around the room after making an awesome Catapult. But you got to order fast since the order cut-off is 9/30/14 so make sure to order this special box soon! Visit Green Kid Crafts to reserve your special box today! I myself LOVE these Princess KH Shoes! Aren't they AWESOME!! What's even cooler is that they're $35 cheaper right now!! I also like quite a few of their tanks that are on sale, including this Sport Essential Stride Tank that's on sale for just $26.97! I can't believe how much money you can save by shopping in the Reebok Outlet section! It's hard to believe that everyone's not already taking advantage of these amazing deals! If you haven't visited them yet then what are you waiting on? Head on over to Reebok.com and SAVE up to 50% off before it's too late! Mabel's Labels is offering two great 50% off promotions! Mabel's Labels is offering two great 50% off promotions! For today only, Mabel's Labels is offering 50% off Pirate Ship or Skull 'n' Crossbones Sticky Labels in honor of International Talk Like a Pirate Day. Plus, on 9/20, Mabel's Labels is offering 50% off Plane Sticky Labels for their second year of Talk Like a Pilot Day, created by Mabel's Labels. Don't miss your chance to shop these great offers! Little Passports Fundraising For Your Child's School! Is your child's school thinking about or in the process of planning a fundraiser for the near future? Little Passports is the perfect partner, with an award-winning educational product that not only kids love but parents adore as well! Your community shops at Little Passports and we donate 15% back to your school. They even have an awesome flyer to help you spread the word. For more information visit Little Passports online. The fundraising period is from October 21 -28 and the deadline to sign-up is October 10th so check it out today! Monster Cookies Okay, Monster Cereals fans, did you know this was a thing in 2002?!? Attention busy moms: Toss a bit into the slow-cooker & wait!! YUM! Ease into fall flavors with a comforting pork dinner, made in your slow cooker. Graphic T-shirts starting at just $5 Plus Cargos, Denim, and Activewear for $12 and up! I love shopping at the Childrensplace.com! Right now they have some AWESOME sales and deals going on that you must check out! Graphic T-shirts start at just $5! Cargos, Denim, and Activewear for $12 and up! PLUS... Received $10 in Place Cash for every $20 you spend! Sale Ends on September 29th! Shop at The Children's Place TODAY to SAVE!! All opinions are my own and may differ from those of others. The Disneystore.com is having an amazing sale on their Halloween Costumes and costume accessories! 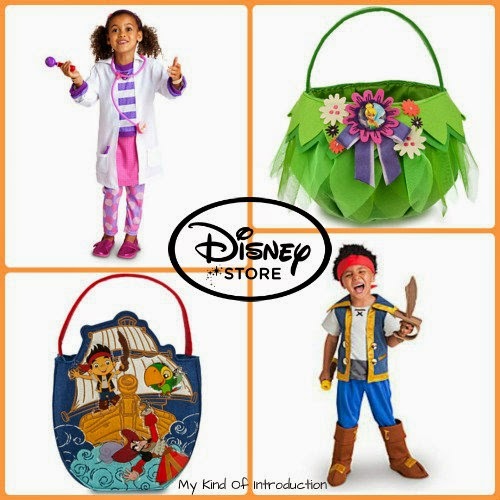 From Doc McStuffins to Disney Princesses to Jake the Pirate... No matter who your little one is dreaming about, you can make their Disney Halloween dreams come true for less this year! Don't forget that that these costumes don't have to be a one time use, Halloween costumes are perfect for dress-up fun as well! Shop now and you can save 25% Off! School is now in full force! You bought new clothes, shoes, TONS of needed supplies.... 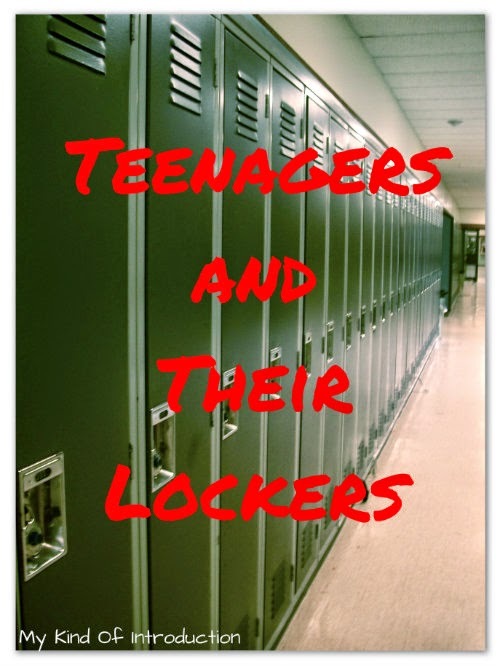 But what about your teen's locker? Don't you think it's about time to add some spark and personality to their tiny storage space? Decorating and organizing your locker can help teens stay as efficient as possible during the hectic school year, which is a MUST in all grades but even more so once they reach High School! Here are a few products that'll help your teen declutter and stay focused all year long.... Don't forget to let them add some style to their locker as well - Personality means more to teens then us parents realize. Don't you remember your teenage years? For those MUST REMEMBER tests and moments! Maximize vertical space in your locker with our ingenious Janus Locker Shelf. Two adjustable shelves provide multiple levels of storage for books, notebooks and school supplies. The locker organizer with mirror holds all those little things that get lost at the bottom of the locker. Two pockets a mirror and a zipper pocket will keep things organized. For displaying that perfect test paper or maybe a photo or two! A great place to store pens, pencils and personal care items. A mirror provides a place to check your look between classes. Super-strong magnets on the back keep it securely in place. Who wants to look at all those dirty stains from past years locker occupants? Add a fur rug and cover them all up... plus you'll be adding a bit of yourself as well! Add some style to your locker walls with Dry Erase Locker Wallpaper. Why? Because it AWESOME! Locker Chandeliers?? OF COURSE!! Why not? 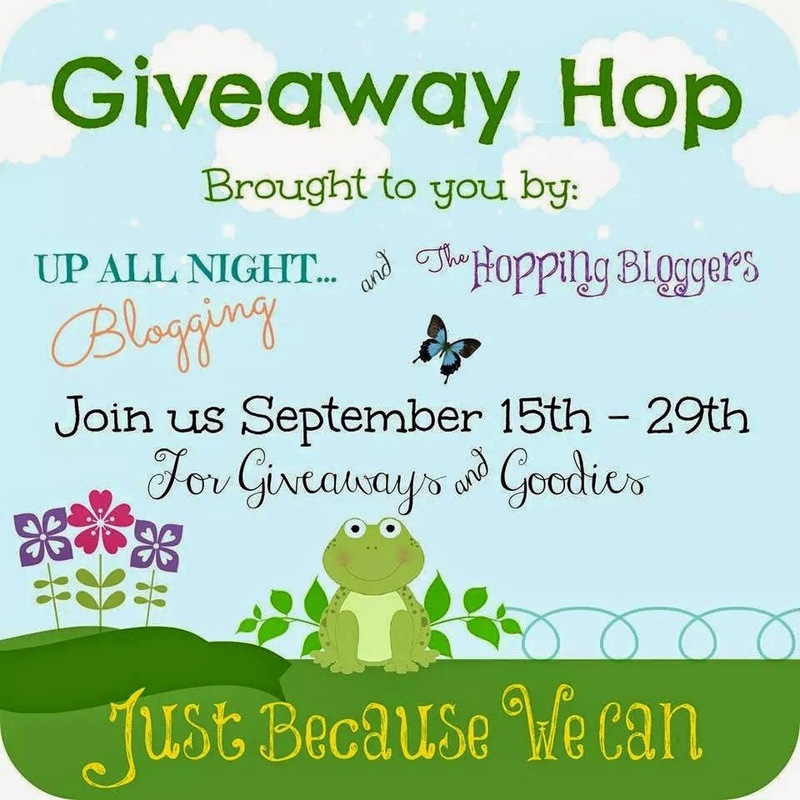 #JustBecause We Can Giveaway Hop!! The Hopping Bloggers and Up All Night Blogging! We are a group of bloggers that specialize in giveaway hops - so stay with us and you will have many chances to win some amazing prizes! Each of the bloggers participating in this hop has a giveaway with a prize value of at least $20 - and some are much more than that! Be sure to visit them all - there is no limit to how many prizes you can win! MACE Pepper Spray is giving away one bottle of spray with a flip and grip safety cap. Read A Small Village's review here to learn more about how to use MACE Pepper Spray! Don't forget to Hop Along to the other #JustBecause We Can Giveaways! September 15th for more prizes! Zulema, publisher of A Small Village Blog received this product free in exchange for an honest review and giveaway. A Small Village and any other participating bloggers are not responsible for shipping or prize fulfillment. This giveaway is not associated with any social media networks including Facebook, Twitter, or Pinterest. This blog accepts compensation in the form of products and/or monetary for selected posts which will be labeled as sponsored. No matter the compensation, I only write about items and/or services that I have personal experience with and believe my readers will enjoy and/or benefit from. All opinions are my own and may differ from those of others. 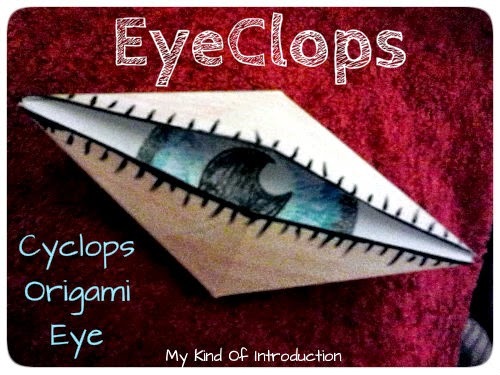 To create your own Eyeclops follow the step-by-step instructions below. Start with a regular piece of computer paper and make it into it a square by folding the corner over to the opposite side, show in the photo above. Before unfolding your square, fold the corners together to create a triangle. 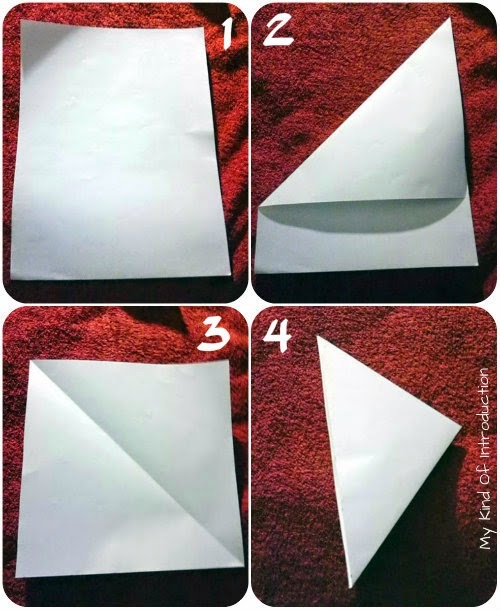 Unfold your paper and fold one corner to the center. Make sure the creases are tight. Fold the opposite corner to the center as well, using tight creases. Fold up the top and bottom corner, like in photo square 9. 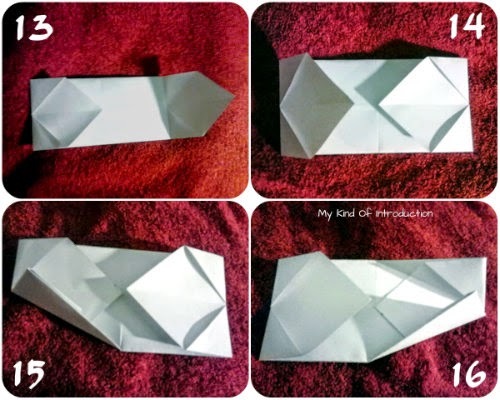 Fold up the paper one more time using the creases you already have on your paper. Draw an eye in the middle of the paper. 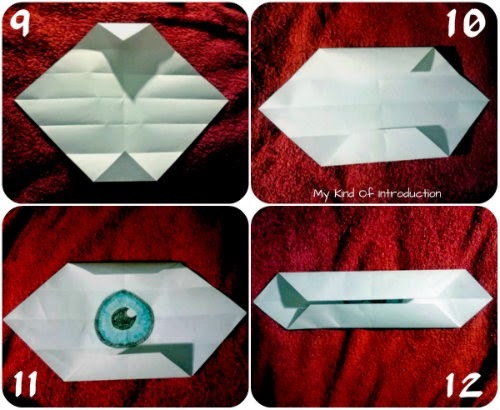 After your eye is complete, finish folding up your paper using the remaining creases, shown in photo square 12. 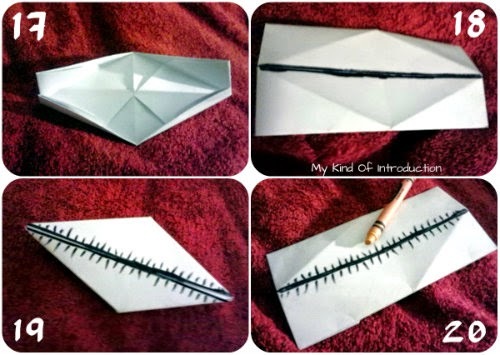 Flip over the paper and fold your corners into the middle. 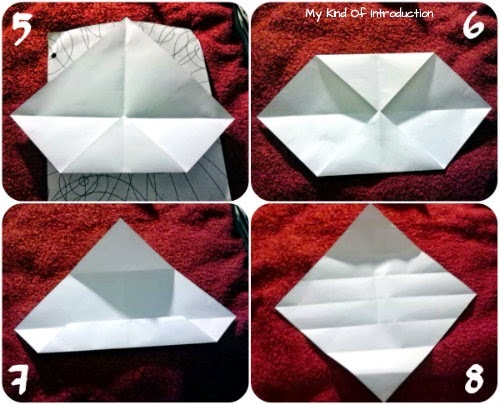 Fold the corners in at an angle on both sides, like seen in 15 and 16. Using a black marker, draw on the eyelashes as well as drawing a black line on the paper edges as shown in picture square 19. 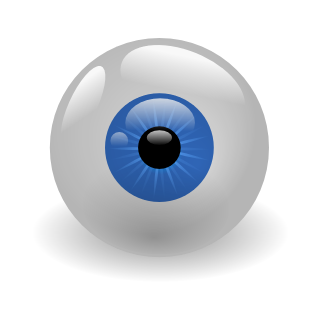 Color your eye as wished.